Get on the Waiting List for the LIVE 2-Day Event now! Your Second Half Should Be Better than your First!! Stuck? Can't Compete? Too Old? Tech Challenged? Not Good Enough? NEED HELP NOW? Start this CHANGE YOUR LIFE: GET UNSTUCK Online Course FREE! 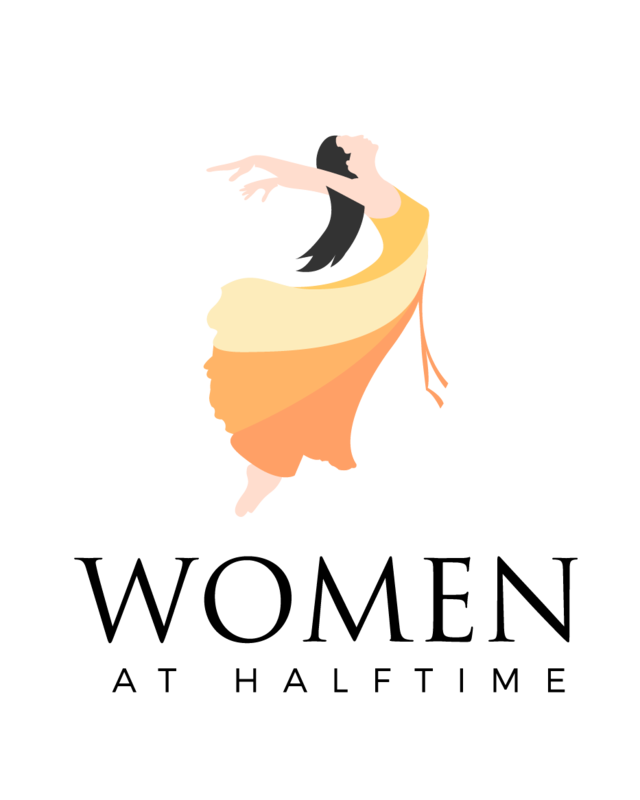 Start CHANGE Y​OUR LIFE: GET UNSTUCK Online Course FREE! ONE DAY YOU WAKE UP ON THE STAGE OF YOUR LIFE… feeling like someone has changed all the lines. What script are you now writing for your second half? Don't waste any more time! Start now! I can fly! shouted Mary, jumping from her seat! Your message was such a breakthrough for me! Mary Lou had recently lost her husband and lost herself in the process. Principles for Producing your Successful Second Half! For women at halftime who want to gain momentum, focus and success. LIVE Summit! Are you one of the 150,000 women entering halftime each month? Women at halftime are 40+ and join the ranks of 45 million women in the U.S.A.! You may be a successful career woman, a spouse, a mother or a friend. Most importantly, you're an individual! There is more opportunity than ever for women at halftime as women are living longer, have greater skills, purpose and freedom! Join the halftime community! 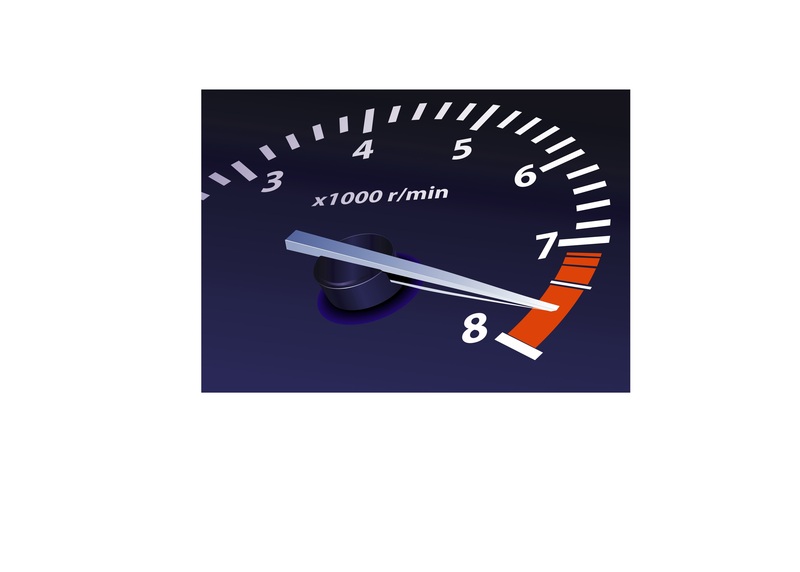 Whether in business, donating your time or just taking some time to breathe, this workshop focuses on you gaining momentum for your second half and having fun doing it! Is this you? "I'm at a point in my life where I like me and I want to keep on liking me!" Feeling LOST? STUCK? CONFUSED? AFRAID? HAVE A FRIEND WHO'D LIKE TO COME? INVITE THEM FOR EVEN MORE FUN! Are you a woman at halftime? Everyone climbs their own Hero Mountain,™ but it’s never more important than at halftime to put the Cables of Success in place. You choose whether to climb Rockslides of Destruction or Cables of Success. Hero Mountain™ Summit is the time to focus on your own self-leadership and life management that affects every other area of your life including business growth, positive self-talk and ultimate legacy. You will walk away from these two days with a PRODUCED PLAN for your Successful Second Half! Hero Mountain™ focuses on your whole life including both your personal and professional life. When one part is out of balance, the other part suffers. Create your personal identity map with your abilities, your attitudes and your dreams. Define your heart-centered work, combined with your present work and life. Identify the cables of success in your personal and professional life. Identify dangerous rockslides of destruction you are currently on or headed for. 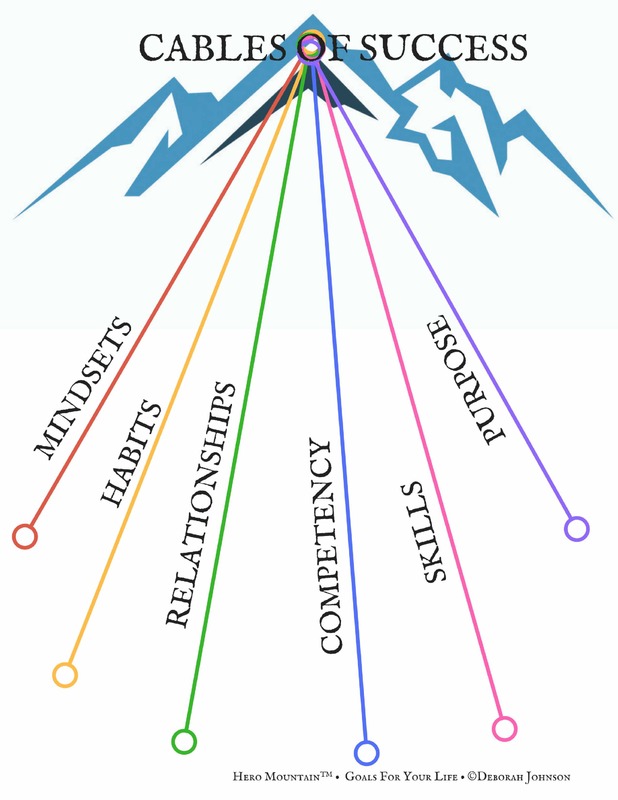 Cables include Mindsets, Habits, Relationships, Competency, Skills and Purpose. Craft language that turns negative rockslides to positive cables of success and role-play scenarios to implement that language. Construct your master life plan for the business, personal, spiritual and legacy parts of your life. Formulate your strategy for cables of success as you face the future decades of your life. 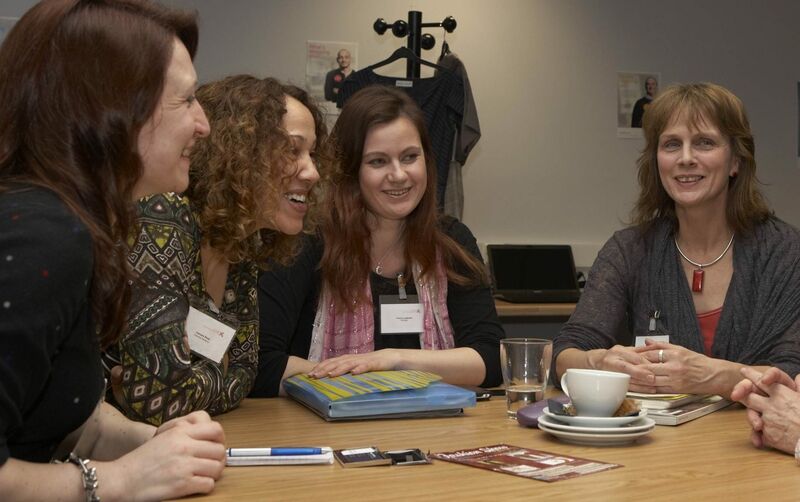 A weekend with like-minded women also committed to their growth and lifelong learning. Small LIVE group limited to 20 participants. We realize your TIME is extremely valuable. This will be well-worth your time, guaranteed! THE FUN METER IS ON! Concentrated time to work on YOU! When is the last time you spent time on your personal career, purpose and goals? Whether in business or volunteering your time, this is important! Define YOUR Cables of Success! Purpose, Mindsets, Habits, Relationships, Competency and Skills! All are important for your success in your second half and are covered in Hero Mountain™ Weekend! Every woman is unique in skills, in passion and in life situation. Learn from others who are at the same place you are! Define your passion, whether in business, non-profit, leisure or leading a small group study! Do you have trouble accomplishing what will move you forward in life? Deborah provides extra monthly boosts for your success to move you closer to where you want to be! Access your FREE Head Trash Video Course at the bottom of this page! Don't miss out on this twice a year opportunity! DEBORAH JOHNSON, M.A., international award-winning music artist, author, speaker and National Media Commentator helps others get unstuck by producing a successul plan and strategy based on strengths, interests and lifestyle. Up for multiple GRAMMY Awards and spending over 20 years in the entertainment industry, she's an expert on how to constantly reinvent yourself in a gig-economy. She is also the recipient of the 2018 Women's Economic Forum Exceptional Women of Excellence Award. 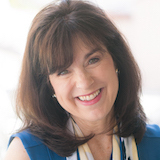 Deborah is the author of Stuck is Not a Four Letter Word, ​Bad Code​ and Women at Halftime. She speaks and performs in both live and virtual events. She is also 2018-19 President of the L.A. National Speaker's Association. Deborah Johnson is a pro. Her ideas are fresh. Gave me a new perspective of how to move forward. The depth of layers that Ms. Johnson was able to bring to each session was magnified by her high level of musical ability...an asset to any organization. 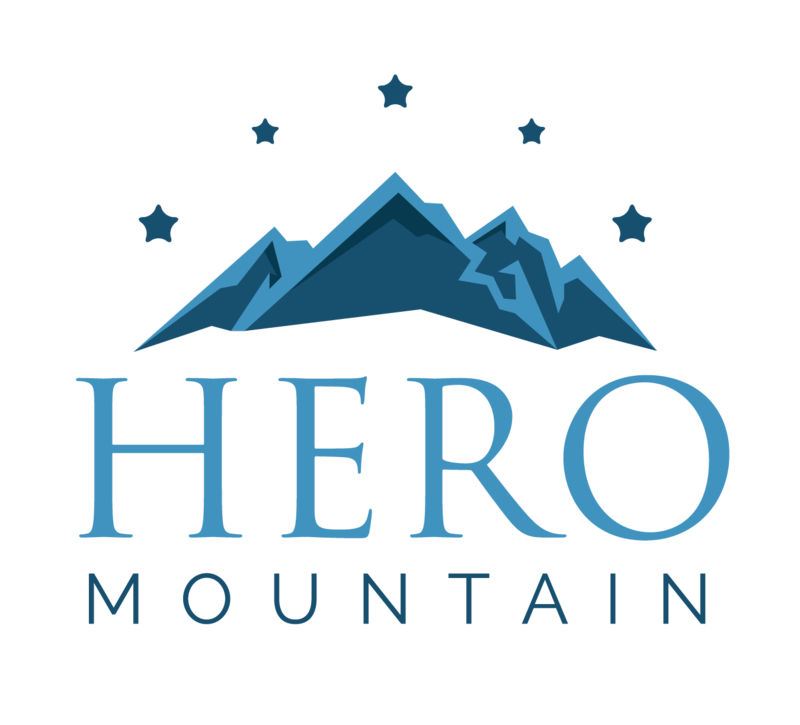 Deborah also presents Hero Mountain™ as a seminar/breakout session for corporate events. She is known as a Master Producer!